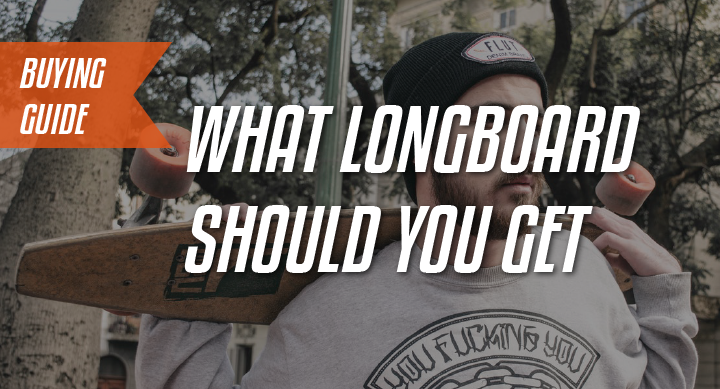 →What to look for in a longboard? What to look for in a longboard? Picking your first longboard is not an easy task. Even more so if you don’t have anyone to point you in the right direction. There are so many options and they looks so similar on the surface. It gets a lot easier once you know how everything works and what’s appropriate for what. So in this weeks article, I will be explaining in simple detail what each part of the longboard does. This should help you pick out the perfect board for yourself because the longboard you should get is one that best suits your needs and the one you can have the most fun on. The longboard basics – how does a longboard work? Let’s first understand how a longboard works; A longboard is basically a piece of wood with trucks and wheels connected to it. The trucks are the ‘steering wheels’ and help turn the board left or right. The wheels allow it to roll back and forth. Inside the trucks, there are bushings which act as ‘suspension’. These bushings decide how easy it is for you to turn with the trucks and can be customized so you can have your truck turn a lot or to have it turn a little. In the wheels, we have bearings. The bearings attach the wheels to the trucks allow them to roll smoothly. The longboard deck is the standing platform and can come in different types of shapes, sizes and flex’s. It can also be made from different things. 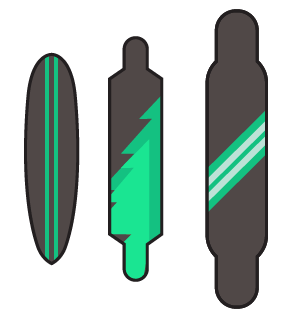 There are a few main types of longboarding. Each of these styles have different types of boards, deck shapes, wheels, and trucks. I’ve briefly described them for you below and this should help you when buying a longboard that will work best for you. Cruising/Carving – This is the most common type of longboard and you’ve probably seen some of these around. They come in different shapes and sizes but are all geared towards the same thing. They are designed to be easy to ride, to turn great and to be comfortable to skate on. In this list you’ll see some good cruiser board examples. Cruiser decks often have fancy designs and come in a variety of colors and graphics. The trucks used are either tkp (traditional kingpin) or rkp (reverse kingpin) for smooth and easy turning. Big soft wheels (bigger than skateboard ones) are used on the boards and they give the best ride possible. This is because they roll over pebbles and cracks easily. Bearings also contribute to the smooth ride, but often the stock ones on longboards aren’t that good. It’s a good idea to replace them. Click on the link if you need to see some good longboard bearing examples. Dancing & freestyle – This side of the longboarding community is pretty big, especially in Europe. Surprisingly, it’s still growing and is gonna be huge one day. It requires a big board (around 40in long) so you can do all the maneuvers comfortably. With rkp trucks for the best turning and small wheels so your setup won’t be too heavy when you try do those flashy flips. Downhill/freeride – This style is about going fast down hills and doing slides on your longboard. The boards used are typically stiff so the rider can have the best stability when going fast. The trucks they use are often of a lower angle for stability at high speeds, and the wheels they use vary in shapes and sizes. Their setups are good for going fast but don’t carve and cruise as well at slow speeds. Check out this Landyachtz switch on Amazon.com for an example of a downhill board. Downhill skaters also use helmets and slide gloves for safety and the slide gloves to help them slow down when going fast. There are a lot of types of longboarding and I can already think of a few I haven’t mentioned. I purposely have not because I don’t want to confuse you with too much information. We’ll get deeper into the other styles in another article. Which trucks are the best? So there are two main types, they are tkp and rkp trucks. The tkps are what you often see on skateboards. They are great for doing tricks and grinding rails, and they also make decent trucks for cruising and carving. The other trucks are the rkp trucks. These mainly feature on longboards and are designed to be smooth turning and stable. They are great for cruising and carving, and they arguably do it better than the tkps. I highly recommend them for cruising and anything else longboard related. To learn more about them, check out my list of longboard trucks. There are also some unique specialist trucks like the Gullwing sidewinders. These are double tkp trucks and they are suuuuuper turny. They are designed so you can have maximum turning on them and so you have the best possible time when cruising around. They are designed to work perfectly with some Sector 9 cruiser boards and it’s a match made in skate heaven – flexy longboard with really curvy trucks. Find out more about these boards on amazon.com. Which longboard wheels should you get? Longboard wheels come in different types of shapes and sizes too. They also come in different levels of hardness with different cores. Most of this doesn’t matter too much for beginners but if you want to learn more, read on below. Longboard wheels are usually tall, around 60mm to 70mm in height. Some are taller than that but those are usually specialist wheels. The taller the wheels are, the smoother they roll and the easier it is for them to go over cracks, pebbles and on rough roads. However, the taller they are the heavier they become and it makes them harder to push. Wheels around 70mm tall are perfect for cruising. Wheels also have different lip shapes. Some are rounded and others have sharp (or square) lips. The round lips slide easily and can often breakout if you carve too hard on them, but the square-lipped wheels really hug the road and try to stop the wheel from sliding. They will break out if you carve hard enough though. Some of the best wheel brands are often on the expensive side, but this is for good reason. A lot of research goes into their wheels. The spend a lot of money and time on finding the perfect shape, urethane, core etc. for their wheels. However, if I am honest, generic wheels are more than good enough for cruising and when you start out. Trust me on this. What longboard length is the best? For beginners, a bigger and longer board will be easier to ride. Having a longer board means that the trucks will be further apart from each other and that the longboards turning radius (how tight it can turn) will be increased. An increased turning radius makes the board more stable and this makes it harder for the rider to get wobbles. However, this also means it won’t turn too amazingly at slow speeds. But yeah, not everyone wants a 40in longboard. Some people want small cruisers they can carry around really easily. The problem is though, a lot of small boards are uncomfortable to skate. The secret to a cruiser that is comfortable to skate is to get one that is short, but wide enough for your feet to stand comfortably. Most tiny cruisers are uncomfortable because they are too tiny for your feet (like the Penny boards). When a board is wide enough to accommodate your feet it becomes easy and enjoyable to skate. How much should your first longboard cost? The best longboards for beginners don’t have to be expensive. Typically, you should pay what you can afford, but I recommend you save up as much as you can. This is because the higher quality longboards offer a better riding experience but they often cost more. However, that is not to say that there aren’t great cheap longboards. A good example of a quality but affordable board is the ten toes cruiser board. Check out its pricing and features on Amazon.com. The better riding experience comes from having good trucks and good bearings. You can buy a cheap cruiser board and simply upgrade these parts as you go along. It’s the most affordable option towards getting a longboard that rides really well.. So how can you pick the perfect longboard? To pick out the perfect board you first need experience. You need to learn about what type of board does what and what feels best under your feet. If you’ve completed reading this article you are well on your way and you’re over the first hurdle. My next advice for you, is to simply not think too much and to go for the longboard that catches your eye. Over thinking won’t help anything and it will simply put more time between you and your perfect board.